Personal challenge, physical and spiritual adventures, encounters with other cultures, the prospect of riches, a desire to build different societies -all of these are reasons artists have looked to Alaska for a new frontier. Unlike the rich tradition of Native art in Alaska, which is thousands of years old, European and American artwork of Alaska has a precise and much more recent starting point. These early works were attempts to understand and describe a new and 'exotic' people and place, to fit them into a more familiar version of the world. Beginning with the Russian voyage led by Danish navigator Vitus Bering in 1741, American, English, French, Spanish, and Russian explorers made more than 100 voyages to Alaska during the 18th and 19th centuries. Although the making of artistic pictures was not a premier motivation for these voyages, virtually all the expeditions included documentary artists in their entourages, to document the discoveries made by captains and their crews. Prior to the Gold Rush, painters confined themselves to coastal settlements. Trained professional artists of some reputation produced the majority of surviving images, but their work was unvaryingly under strict restrictions against any distortion, embellishment, or interpretation. Today, our awareness that artists were directed to depict what they saw with complete and accurate 'realism' makes it even more interesting that interpretive cultural biases are nonetheless evident in their work. For example, explorer art often emphasized exaggerated details such as Native women with bared breasts, or facial tattooing, perhaps to underline the artists' cultural perception of their 'uncivilized' state. Widely associated with the years of early Alaskan exploration is the much published art of John Webber (1751- 1793), the prolific official artist for British Captain James Cook's landmark voyage of discovery from 1776-1780. Official artist Gaspard Duche de Vancy (d. 1788) recorded the French voyage of explorer Jean Francois Galaup de la Perouse, from 1785 to 1788. Louis Choris (1795-1828), who accompanied the Russian voyage of Otto von Kotzebue, between 1815 and 1817, succeeded in conveying reality perhaps more than most of the artists who accompanied explorations in the late 18th and 19th centuries. Choris managed to produce empathetic, insightful images of Alaska's native people, capturing an astonishing variety of details of the material culture, without the stereotyping that is typical of much 'expedition art'. 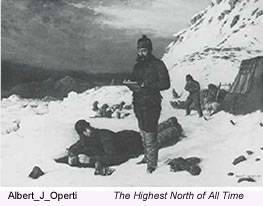 Some of the most fascinating depictions of Eastern Arctic exploration in the late 19th century were by Albert J. Operti (1852-1927), who painted many canvases chronicling the polar exploration of the era, and was himself a member of the 1896 and 1897 expeditions of Robert E. Peary. The last great exploring venture to Alaska was the Harriman expedition of 1899, which traveled up the coast of Alaska as far as Plover Bay in Siberia. Sponsored by the railroad and mining magnate and sportsman Edward Harriman, the elaborately outfitted expedition included such well-known scientists and naturalists as John Burroughs and John Muir. Artists Frederick S. Dellenbaugh (1853-1935) and Robert Swain Gifford (1840-1905) were retained to record landscapes; Louis Agassiz Fuertes (1874-1927) was employed to paint birds; and Edward S. Curtis (1868-1952), then a little known photographer, to photograph the scenery and crew. In the first century of outside contact, the unfamiliar Native culture attracted the attention of explorer-artists, and the dramatic landscape of Alaska served as a mere backdrop for documentary, ethnographic portrayal. By mid 19th century, however, the 'heroic' period of Arctic exploration by Europeans was ending, and exploration, as well as exploitation, of Alaska was increasingly taken up by Americans. More artists began to focus on the equally astounding landscape. This shift in emphasis is also reflective of the changing stylistic preoccupations of artists in America and abroad. The mid 19th century saw the flowering of the American landscape painting tradition, and energetic, ambitious artists visiting the Territory were well aware of such developments, and eager to adapt the new styles in painting to the Alaskan landscape. As the 19th century ended, the Native Alaskan traditional culture was under siege, due to events such as the Gold Rush, and non-Native artists, European, Canadian, or American, often attempted to recapture by selective vision and representation, a lost exoticism, mystery, and 'otherness'. Artists gradually turned away from the portrayal of Native people, however, to tackle the more straightforward but still challenging subject of the landscape itself. Up until approximately 1850, due to the difficulty and danger of travel within the region, the only artists with practical access to Alaska were those attached to official exploring expeditions and a few commercial operations. The period immediately following the purchase of Alaska from Russia in 1867 saw a gradual rise in boat traffic to the relatively milder climate of the Territory's South East portions. Regular service from United States ports to Sitka began immediately following the purchase, including sailings out of Portland and San Francisco. John Muir's writings of his visit to the Territory brought wide public attention. The onset of the Klondike Gold Rush spurred a meteoric rise in visitors. Among the thousands of fortune hunters and adventurous tourists were some of the best-known landscape painters of the day. One of the first Americans to visit Alaska, Cleveland artist Henry Wood Elliott (1846-1930) created many works depicting the area, and is particularly noted as a savior of the fur seal. Elliott visited Alaska in 1866 in connection with an ultimately unsuccessful attempt to lay a Russian-American telegraph line across the Bering Strait. Later he was the official artist for the United States Geological Survey of 1869-71. Among the many professional artists who journeyed to Alaska after the purchase of the Territory were Vincent Colyer, Frederick Whymper, Joseph Henry Sharp, William Keith, James Everett Stuart, Lockwood De Forest, and Eliza Rosanna Barchus, and Theodore Richardson. Keith's paintings of Alaska were exhibited upon his return to San Francisco in a show at the Bohemian Club, titled 'Dreams of Alaska'. Keith's works are significant because they are not close transcriptions of actual scenery, but rather are fantasies inspired by Alaska. They are important as they represent a major break from the documentary tradition in landscape painting of Alaska, as they show an interest in capturing its spirit versus just the topography. One of the most spectacular Alaskan landscapes of the 19th century is that by Thomas Hill, (1829-1908) who was commissioned by John Muir in 1887 to paint 'Muir Glacier'. Probably the best known painting of that time is that by Albert Bierstadt (1830-1902), 'Wreck of the Ancon, Loring Bay, Alaska', a stunning piece, quite atypical of the artist's work, depicting an abandoned vessel lying isolated and motionless in a misty fog. Particularly prolific in his paintings of Alaskan scenes was James Everett Stuart. Henry Culmer (1854-1914) is regarded as the first professional painter to penetrate the interior of the region, which he did while commissioned by the Alaska Steamship Company. From Cordova he traveled by rail to the Kennicott and Bonanza Mines, rich in copper, and also painted glaciers of the region. Early in the 20th century, a new kind of motivation developed for visiting Alaska. 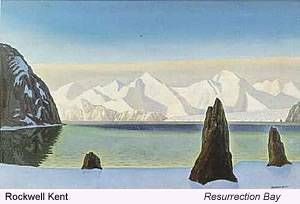 The northern wilderness became not just a source of scenery, but a haven for the troubled spirit, and a purer source of inspiration, as was experienced by Rockwell Kent (1882-1971) in 1919 when he and his son spent almost a year on a remote island. Walter B. Styles (in Alaska during the 1880s) was one of the earliest artists to spend a prolonged time in the Territory, and while there he recorded life among the Tlingit Indians. Four artists who made their homes in Alaska for long periods are particular favorites of Alaskans. Known as the 'Alaska Four', they are Sydney Laurence (1865-1940), Eustace Ziegler (1881-1969), Theodore Lambert (1905-1960), and Jules Dahlager (1884-1952). These artists have, over time, taken on an almost mythic status in the minds of long-time Alaskans, and have influenced in varying degrees the way they see their own land. Alaska's most beloved and renowned resident artist and historical painter, Sydney Mortimer Laurence is best known for his trademark paintings of Mount McKinley. He, perhaps more than any other artist, helped create an image of Alaska as 'the last frontier'. Ziegler was a missionary and painter in Cordova, and his works covered a variety of subjects, from portraits, to Indian villages, to landscapes, as did the works of Dahlager, who also painted in the Cordova region. Ziegler is particularly significant for having depicted Natives neither as exotic, noble primitives, nor as downtrodden examples of a culture under siege. Belmore Browne (1880-1954), an artist often associated with Mount McKinley, was also a mountaineer and writer, and in the early 1900s created numerous depictions of the great mountain as well as Alaska's animals and landscapes. Augustus Dunbier (1888-1977) was one of the first artists from the Midwest, and likely the first from Nebraska, to paint in Alaska in the early 20th Century. He spent the summers of 1926 and 1927 based in Sitka. From the first trip, he returned with twenty-two canvases, which he exhibited at the Seattle Art Association and the San Francisco Art Association before returning to Omaha. The full, long, and rich history of Native Alaskan art is a separate subject from the more European traditions that are the focus of the AskART database. The influence of Western contact upon the evolution of Native art is, however, to be noted. Representational drawings on ivory and bone have a long history among native Alaskan cultures. These traditions were readily adapted to ivory scrimshaw during the Yukon Gold Rush and the heyday of the whaling industry of the late 19th Century. 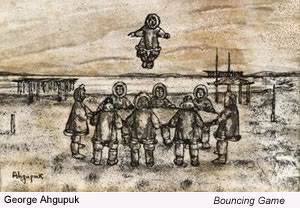 Beginning in the 1920s and 1930s, several Inupiat and Yup'ik Eskimo self taught artists began drawing on paper and on tanned skins and hides. George Ahgupuk, Robert Mayokok, James Kivetoruk Moses, and Florence Nupok Malewotkuk are widely regarded as the first artists to employ these new media. These artists recorded in pen and ink and/or watercolor drawings traditional lifeways that were quickly changing as natives became increasingly acculturated. European visitors and settlers brought with them materials and techniques that were new to Native artists, resulting in intriguing transfer of subject matter from one medium to another, for example changes from carving and engraving on ivory, to paper. As drawing materials became more widely available, a number of Eskimo artists made drawings on paper about their way of life, and the life of newcomers to their territory. George Ahgupuk (1911-2001) along with his brother James Kivetoruk Moses (1900-1982), was a leader in the establishment of graphic arts on paper among Native Alaskan artists more than a century ago. Said to have been 'discovered' by Rockwell Kent in 1937, Ahgupuk, like a number of his compatriots, had taught himself to draw while hospitalized for tuberculosis. Perhaps because carving and engraving, and the drawing ability they required, was long considered the particular domain of male Natives, one woman, Florence Malewotuk (1906-1971), is especially notable for her exceptional drawings on paper, as well as on seal and walrus skin. Native artist Guy Kakarook (b. late 1800s) especially known for his drawings in watercolor, ink, and crayon on paper. In the 20th century, and now the 21st, Native artists continue to draw upon their traditional images and materials, while adopting new materials and techniques. Their contribution to the development of drawing, painting, and sculpture in Alaska has been substantial, and Native artists are among the most prominent artists working in the region today. Alvin Amason (b. 1948), of Alutiiq ancestry, is regarded as one of the current best painters of the state, capturing Alaska's wildlife with humor, affection, and respect. Ronald Senungetuk (b. 1933), an Inupiat Eskimo, has perhaps the most extensive national and international exhibition record of any Alaskan artist. Today a number of professional artists painting in Alaska are using their talents to bring world attention to issues of profound interest to the state, as artists are doing in many parts of the globe. For example, The Artists for Nature Foundation, a Netherlands based group of over 100 artists from the United States and more than twenty other countries, has selected Alaska's Copper River region one of their focus sites. These artists are dedicated to promoting, through their unique perspective, the conservation of natural and historical landscapes around the world, using the universal language of art to achieve these goals in a positive way. Some contemporary American artists who live in, or have traveled to, Alaska to participate in this work are Tony Angell, Pat McGuire, Susan Ogle, Andrea Rich, David Rosenthal, and Todd Sherman. Alaska is an inspiringly beautiful and rich land that they seek to protect and preserve, a region that continues to inspire generations of artists. Credit: Kesler Woodward, Professor of Art Emeritus. University of Alaska Fairbanks. Credit for portions of the above information is given to the book 'The Civil War, A Centennial Exhibition of Eyewitness Drawings' by the National Gallery of Art.